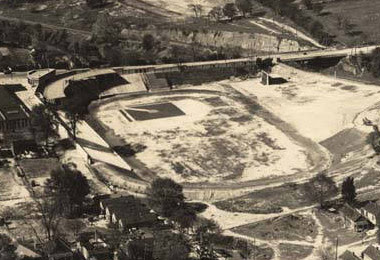 Montgomery's Cramton Bowl shortly after completion in 1922. On Sept. 20, 1922, Alabama's freshmen football squad traveled to Montgomery where they defeated Sidney-Lanier High School 21-0. The game was the first gridiron contest ever played in the Alabama state capital's new multi-sport venue, The Cramton Bowl. The stadium was built on the site of a former sanitary landfill owned by local lumberman, F.J. Cramton. The businessman spearheaded the $33,000 fundraising effort to get the facility built after the City of Montgomery balked on the project saying it was too large an undertaking. The completed Cramton Bowl was designed to host both baseball and football games. 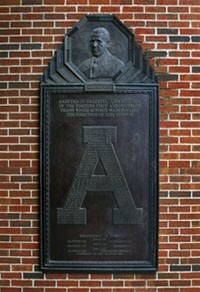 The first sporting event at the new stadium was baseball game played May 1922 between Auburn University and Vanderbilt University. Montgomery attorney James Edson contacted University of Alabama President George H. Denny about arranging to have the Crimson Tide play open its football season in the new stadium. Denny agreed to a game but suggested instead the scheduled contest with Georgia slated for Nov. 25. 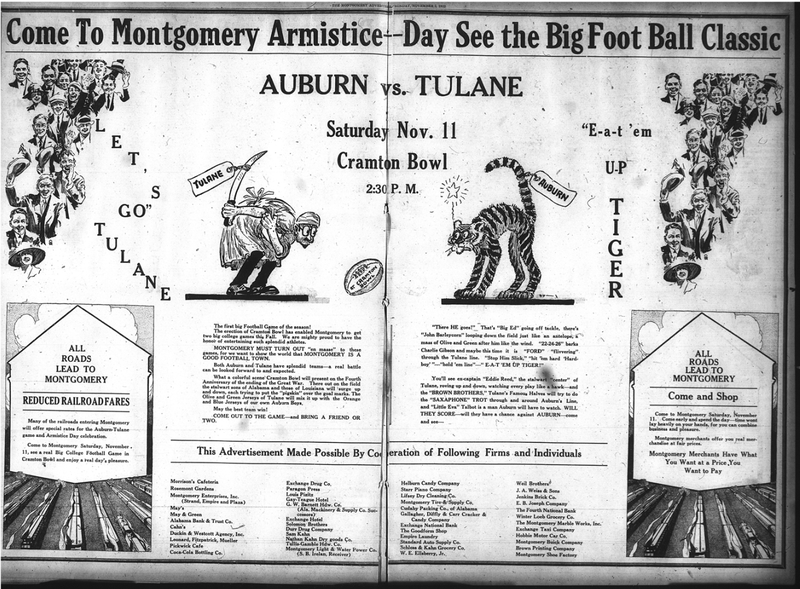 The first major college football contest in the venue was Tulane vs Auburn on Nov. 11, 1922. The local paper implored residents to show up for the game "to show the world MONTGOMERY IS A GOOD FOOTBALL TOWN." The Tigers, led by their legendary coach Mike Donahue in his final year, trounced the Green Wave, headed by their legendary coach Clark Shaughnessy, 19-0. Two weeks later, the Tide varsity made the trip to Montgomery themselves and downed the Bulldogs 10-6 in the Cramton Bowl. The finished stadium could accommodate about 7,000 with its permanent seating but reports put the size of the crowd at almost 10,000. 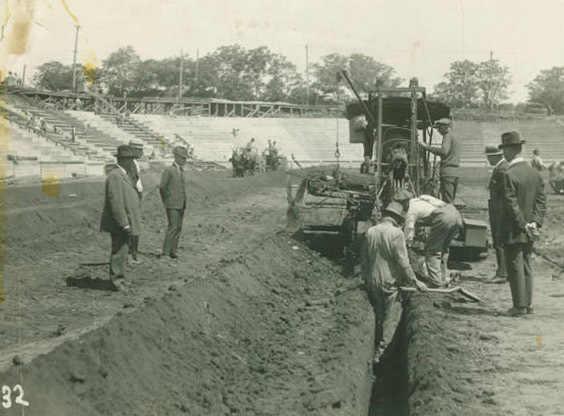 The stadium also was the site of the first football game played under artificial lights in the South when Cloverdale taking on Pike Road High School on the night of September 23, 1927. More than 7,000 spectators were on hand to see the contest under lights that were shipped in from California. Between 1922 and 1932, Alabama played at least one game every season and then returned to Montgomery intermittently until 1954. Alabama's all-time record at Cramton Bowl stands at 17 wins and 3 losses. The stadium was more renowned as the home of the annual inter-sectional all-star contest -- the Blue-Gray Football Classic, an annual college football all-star game which was held there each December from 1938 until 2001. The Blue-Grey Classic never really got its due. Took a lot to pull folks away from the table at Christmas back then. But the TV networks ate it up because is was fubaw.